I have a confession. I am the worst when it comes to sending out Christmas cards. I'll even buy a pack with the best of intentions and never send them out. 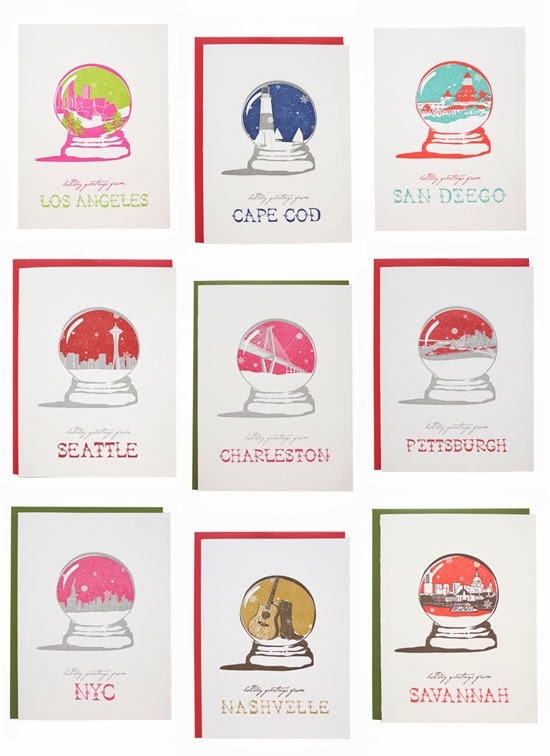 Maybe if I get a set of these cute city cards by Smudge Ink and start working on them now, they'll be ready to mail before Christmas 2014. But really, who am I kidding? I do the exact same thing! I found 2 boxes of cards that I bought last year and I still didn't send them out. I'm real bad at mailing things! lol! Oh thank goodness, I'm AWFUL at mailing. I used to buy cute card packs and think of all the packages I'd love to send. Then I realized that I don't ever send them! I forget until I feel like it's too late... then it's two years later and I have to face the facts: it's not going to happen. Natalie, I'm the same way! And then of course I feel guilty when I begin receiving them in the mail from friends and family.